6.What's eco-frustrating and/or eco-fantastic about where you live? I still don't know what to do with lids off tins, yogurt pots. Polystyrene meat trays. What is the best type of deodorant to buy, not an aerosol can that is for sure. 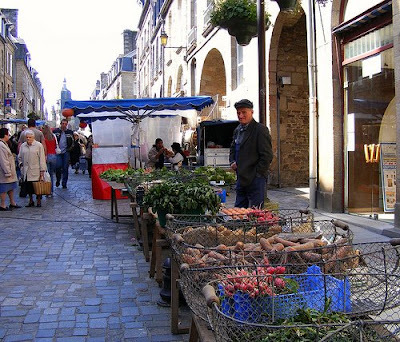 French markets are great for fresh French produce, some small stallholders sell locally made bread, veg cheese etc. However the prices can be very expensive, which is no surprise when you learn how much tax self employed people have to pay to the government. Although the French have convenience foods just like everybody else they still tend to eat a lot of meals cooked from scratch or food in season. 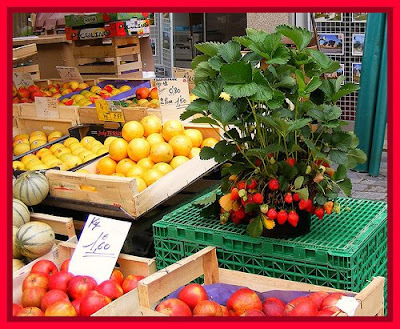 If I could afford to I would support the small stallholders rather than shop in supermarkets. What a dilemma. Here is another picture taken in summer at the Saturday morning market in Fougeres. Any way I can not stop because my veg chilli which I cooked on the woodburner is ready. Wow Blu.........your comments on that taggy thing are fantabulous!!!!!Wow!! !